A couple of weeks ago I was discussing the idea of the history of Filipinos in the U.S. with two friends. The two of them (pinoy and pinay) seem to disagree with me on the issue of the point of departure for Filipino historical study. I ruffled some feathers by stating that the arrival of Spanish Galleon (that carried Luzones Indios) in Morro Bay, California in 1587 was not a good point of historical departure. I argued that American Colonialism was a proper place of beginning a “Filipino American History”. Needless to say, I didn’t come off very convincing to my colleagues. I was accused of being negative, and for putting to much concentration on numbers, and to top it off, paraphrasing what one of them said: “elevating Americans in Fil-Am history”, instead of focusing on Filipino efforts. I was troubled by this uncritical acceptance of history. As if Morro Bay landing was a “Filipino effort” (they were under Spanish servitude). It seems various online sites and Fil-Am groups (as far as my experience with them goes) privilege this event. I have no problem mentioning it as a historical event, but to foreground it as a significant event in Filipino American History lends itself to a poltics of recognition, a strategy under the logic of liberal multiculturalism. Privileging this event (The rationale for having Filipino American History month in October is because of this event) becomes about integration and pluralism. Implicit in the investment in the importance of this historical event is the lack of Filipino history/culture in existing U.S. curriculum. What is missing is a mention of why there is a lack of Filipino history and culture in the first place. The liberal multicultural logic is one that seeks to integrate and become apart of society without addressing issues of injustice. The history framed in this way shows that belonging precedes justice. I am not disregarding this historical event, it should be studied. But it needs a proper context and presentation. If anything, the Morro Bay landing should be mobilized into understanding the World System of the late 1500s and the complexities of Spanish Colonialism. The approach to this event is tame and watered down. Filipino Americans become interpellated in elevating the Morro Bay landing to the status of a migration narrative. Interpellation is the concept put forth by the marxist Louis Althusser. The process of interpellation is the dominant ideology producing its subject(s) by ‘hailing’ them. In the response to being hailed or called, subjects recognize themselves in the dominant ideology. In short, in the context of the priviliging the Morro Bay landing, Filipinos identify themselves in the dominant ideology of the U.S. Hegemonic state. Not only does the framing of Filipino/U.S. relations lend itself to the logic of liberal multiculturalism, but it obscures the centrality of American Colonialism in Filipino/U.S. relations. Filipinos were not migrants but were colonized subjects. As they say, “We are here, because you were there”. 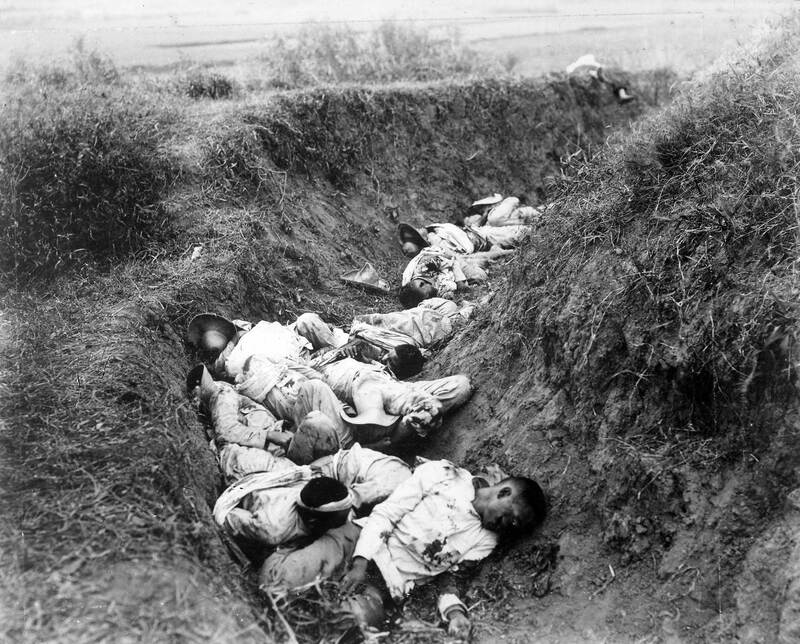 I find it incredible that to this day even in “progressive” circles under emphasize the genocide of the Filipino American War (1899-1902, dates vary), of course they are not to blame when the much of the history is relegated to a footnote in U.S. History textbooks. The privliging of the Morro Bay landing pales in comparison to slaugther of 1.4 million Filipinos (numbers vary, numbers not inclusive of Moro death toll). The necessity of examining American Colonialism at the turn of the century will help us to better understand the Neocolonial present. Instead of murdering Filipinos themselves, the U.S. government relies on the corrupt Gloria Arroyo regime (responsible for 1000 political killings/abductions since 2001), its compradors and landlords, to do its dirty work in keeping the Philippine semi-feudal and within the sphere of the U.S. hegemonic bloc, for reasons of neoliberal globalization and miltary dominance in Southeast Asia and beyond. Geniune critique is needed in Filipino history, I say enough of the self-serving identity politics in abstract “pride”. The 1.4 million dead haunt us, the dying and disappeared today will haunt us in the future if Filipinos shy away from a historicizing and problematizing the political and economic policies by the U.S. and Philippine governments. Filipinos have endured just under 500 years of colonialism. The saying goes “300 years in the convent [Spanish Colonialism], 50 in Hollywood [American Colonialism]”. That needs to be extended to the 50 years plus of Neocolonial control. Another reality is possible, enough of the half-stepping. Ladies and gentlemen, Mr. Ivan Penetrante or banpen as he likes to call himself online. I know what you’re saying about that point of departure in history. Even in the most popular history, Roots and their stories began in Africa, it didn’t begin in the US. But how do we know for sure that it was this abstract idea of “Spanish Colonialism” at work when Luzones Indios traveled with them. Perhaps they saw it as moving with their own volition and did not conceive of betraying their race or anything like that. I don’t know, I’m skeptical of the way we come up with terms today and apply them to a past eras and situations. I like the point about the “migration narrative”, as if there were some kind of non-history to us because we’ve been moving around. Never thought of it like that before. I’m sure people define Spanish Colonialism in different terms, but my usage here is reference to the conquering of the land and subjugation by the natives, and in the process racializing them and genderizing them. Though the Luzones Indios are individual agents their bodies are the sign of the colonized Filipino subject. “Indio” itself is etymologically a derogatory term, which is perhaps why the term “Filipino” was appropriated by nationalist intellectuals like Rizal. I’m curious about your intepretation on my usage of “migration narrative”, how did you interpret it? elaborate. I was using “migration narrative” in reference to the Euro-American migration narrative of arrival/discovery/opportunity. In this case of historical writing the event of the Morro Bay landing is framed in a way to appropriate (and in some senses pre-empt) Euro-American migration/discovery narratives or histories. The U.S. has used these migration narratives as “basic” histories and they have been used as oppressive knowledge regimes in the ways it is deployed as “discovery” and the way it emphasizes the individualist work ethos which people of color are suppose to follow. what happened to our native indigenous filipinos? ?where are they story to till for our new generations. we are lossing our own history from the very bigining our cultures before the spanish or American take over our own filipino tradition?? ?where are they??? I am searching for a native filipino foods.this is just a example I thought is a simple to find but I cant find anything aunthintic native filipino dish. what you can find is a variety of mix culture blinded dishes from a forign cooking not the real native filipino foods.the original endeginous people that start from our native malay,Igorot and other tribes???. if there is any?? where is it?? ?there is no history of how we come accross with the native tribes. like the malay?hindi? ?back from the very bigening of the filipino people..we need to keep this to our culture because that is what the filipino is all about not something made up filipino traditions or foods or even the real history of the real filipino people.what we can teach to our kids is the real one where we start….